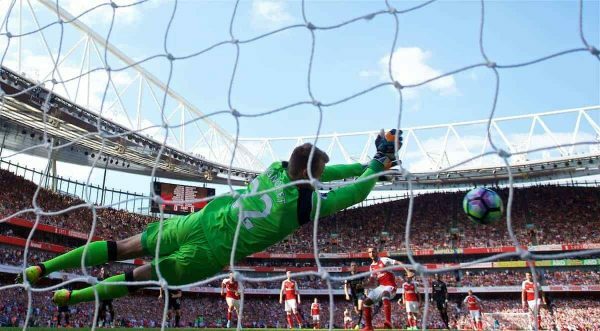 Simon Mignolet‘s penalty save in Sunday’s 4-3 win over Arsenal saw the Belgian draw level with a Premier League record. Mignolet denied Gunners forward Theo Walcott midway through the first half at the Emirates Stadium, covering for an error from left-back Alberto Moreno. This gave the Reds a major boost, and despite Walcott netting minutes later, Jurgen Klopp‘s side went on to seal an emphatic victory. Two goals from Philippe Coutinho, along with efforts from Adam Lallana and Sadio Mane, gave Liverpool a 4-1 lead just after the hour mark, with later strikes from Alex Oxlade-Chamberlain and Calum Chambers serving as mere consolation for Arsenal. Mignolet is currently serving as deputy to summer signing Loris Karius in goal, but underlined his credentials with a strong stop in north London. The Belgian has now saved five of the 11 penalties he has faced in the Premier League, drawing him level with former Chelsea stopper Dimitri Kharine as the best in the history of the English top flight (of those who have faced over 10 penalties). This means Mignolet has saved 45 percent of the penalties he has faced in the league while with Liverpool, better than Manuel Almunia (43 percent) when at Arsenal, Bryan Gunn (40 percent) with Norwich City and Edwin van der Sar (37 percent) during his time with Fulham. Mignolet kicked off his Liverpool career by stopping Jonathan Walters’ penalty on the opening day of the 2013/14 season. This sealed a 1-0 win for the Reds, kickstarting a remarkable title challenge, and he will be hoping his heroics at the Emirates will be equally as inspirational in 2016/17. Mignolet acquitted himself well in Karius’ place on Sunday afternoon, exuding a confidence that was often lacking last season. Karius broke his hand during Liverpool’s 1-0 pre-season defeat to Chelsea, and will be sidelined until October, providing Mignolet with a golden opportunity to prove himself to Klopp. This, naturally, will come with more than penalty saves, with Mignolet needing to pair his exceptional shot-stopping with a composure in possession and authority in the 18-yard box.